In this part of Virginia, we use a pickaxe to plant flowers in our stubborn clay soil, so we feel pleasantly stiff today after planting seven new bushes. We have seen bad results when trees and shrubs were planted directly into this impermeable soil. After a short period of growth, they would die off for lack of nourishment, even when watered. This time I followed directions and made each hole three times as wide as the root ball. This gave me enough room to add a couple of cubic feet of of prepared garden soil from my local hardware store. This should provide enough growing medium to support the bushes for several years. The local clay is so impermeable that tree roots will not penetrate it. We saw giant trees fall in last year’s storms because their roots did not penetrate far enough into the ground. While we were working, I saw this squirrel carrying a section of beef bone. It was extremely heavy and he dropped it and ran off when he saw me. I put it back on the fence post and it was gone this morning. I don’t know how he was going to carry this up to a nest, because he was struggling to carry it on a level course. In any event, I am going to give the trees with squirrel nests a wide berth. If this bone fell out of a sixty foot tree, it would stun you at the very least. Does anyone know what he was intending to do with it? Thanks for the warning (and a laugh): falling beef bones. I believe his intention was to hoard that piece of bone as a source of ready calcium. Consider the cast off Deer antlers that fall to the ground yearly. What happens to them? All kinds of critters gnaw on them constantly, mostly rodents, who are blessed with strong teeth and the need to be gnawing something hard constantly to keep their teeth from growing through their skulls and brains….fatal affliction…. I assume but they would starve to death before that happened. That’s my educated guess. Clarence is right. 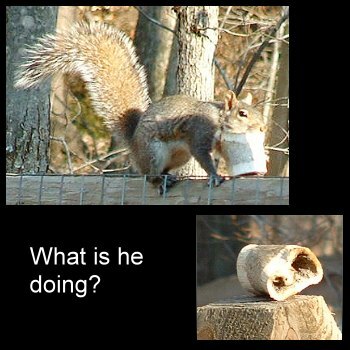 It is very common to find animal bones in the wild that are covered with the scraping teeth marks from the incisors of rodents–chipmunks, sqirrels and mousey-types–that need the calcium for the same reasons we do. Isn’t it neat how they instinctively have an appetite for hard-as-rock bare bones. We know why they do it. They surely don’t. They just do it. Now that you both mention it, I remember seing antlers that had been severely gnawed. I never figured that squirrels were responsible for that before. Now that I know, I will put out more beef bones and see what happens.